So much in the works! Stay tuned. In the meantime take a listen to this podcast interview if you've ever wanted to know how to pronounce 'Dikarya'. You can hear the first half of Halle's audio book on tape and a little snippet of dialogue from The Funny Things You Do by Jason Ogawa. Thanks to Kriss from Notes and Bolts! 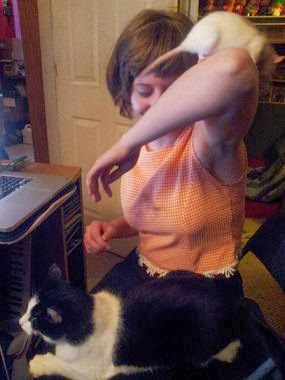 It was a good time talking while trying to balance your cat and rat.